Yelitza Gonzalez feels she is one of the lucky ones. Her small son became badly malnourished. He is one of hundreds of thousands of children suffering during Venezuela’s ongoing crisis. Now thanks to Caritas help, he is back on the road to recovery. The Venezuela crisis is affecting millions of people. Galloping inflation has created an economic free fall that has decimated spending power, employment, and future opportunities. Economic migration is on its way to surpassing the Syrian refugee crisis. Three million people have left the country. They leave because they can’t afford enough food. The average Venezuelan has lost 10 kilos in weight. The economic deterioration of Venezuela has been catalogued by the International Monetary Fund as one of the 20 world economic disasters. Today the country has decreased its oil production, local production of essential goods and is without capacity in its agro-industry to provide the population’s food demands. The Caritas Venezuela bulletin warns that 90% of households have a poor diet. Data at the end of December 2018 show the normalisation of poverty in the daily lives of the most vulnerable. Among the worst hit are the country’s children. Lucilda Mopkapé does not know her age exactly. She thinks she is 35 years old. What she does not forget is that every day she has to make breakfast, lunch, dinner and she has nothing to feed her ten children. They live in the impoverished Sierra de Perijá, on the border between Venezuela and Colombia. The Yukpa ethnic group to which Lucilda belongs settled in the mountains over a thousand years ago and today survives among malaria, guerrillas and a lack of livelihoods that channels them towards poverty. The family survives from their smallholding that her husband cultivates. If they manage to sell their harvest they can buy a kilo of rice and pieces of bone with meat to make “sancocho”, a soup that varies a little the limited diet of the family, which includes seven minors. A Capuchin Mission 944 kilometres from the capital of Venezuela assists more than 20 communities and approximately 3,500 Yukpa and Barí ethnic people. Lucilda arrived at the Caritas programme in September 2018 with her twin sons of one year and 10 months. “I came and it was true that they were here weighing children: that day Alexandra weighed 7 kilos and Alexander 6 kilos,” she added. “I am very happy and they have become happy… Now they rush me for their food!” she adds. An outbreak of malaria caused 20 deaths among adults and children in the community last June. Despite the needs, Lucilda is not losing hope for their children to grow up healthy, safe from disease and strong. She has a daughter in the second year of high school. “That tomorrow they can be teachers and doctors, that’s my joy”. 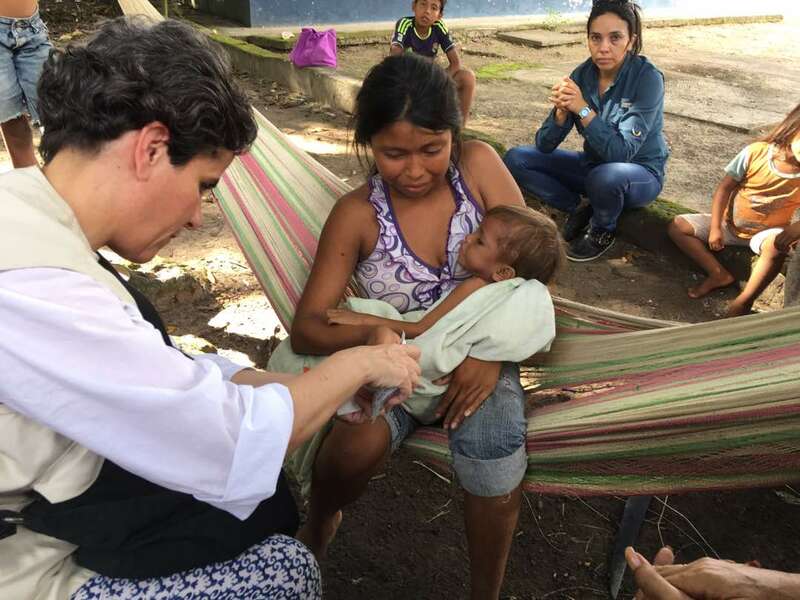 However, the Bulletin of Caritas reports that, despite the decrease of 3.4% percentage points of global acute malnutrition, there are states that still maintain levels of malnutrition above the food emergency like Vargas with 22.7% and Zulia with 17, 6%. 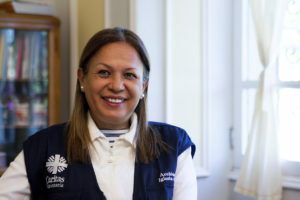 Janeth Márquez is the director of Caritas Venezuela. She said that “we are exporting migrants with acute malnutrition and we are exporting pregnant mothers with acute malnutrition, who are going to have children with acute malnutrition”, in view of the diminished health conditions with which the most of 3 million Venezuelan migrants to Colombia, Brazil, Peru and Ecuador. Caritas Venezuela nutritional adviser is Susana Raffalli. She says an improvement in the condition of acute malnutrition in October is welcome. However she says damage caused by chronic malnutrition will be irreversible for thousands of children. Their physical capacities and intellectuals will be limited she says. Caritas medics have attended 18,890 children; 12,000 children have come under nutritional care of Caritas; 54 percent have recovered. The last Caritas Venezuela Nutritional Situation Monitoring Bulletin collected data nationally in 46 very vulnerable parishes between October and December 2018. Caritas found 57% of children cared for by the Catholic Church are affected with some degree of malnutrition. Of this total, 34% of children present a risk of malnutrition, 15.6 mild malnutrition and 7.3% acute malnutrition. The figures show an advance in the care of children aged 0 to 5 years and pregnant mothers. This is as a result of the approach of the Venezuelan Catholic Church together with Caritas Internationalis and its member organisations to address the unprecedented crisis that the Venezuelan population has been experiencing for 5 years. Caritas is helping the children and old people left behind by this crisis. We are providing food and health care for the most vulnerable.